With music by Alan Menken, lyrics by Lynn Ahrens and book by Ahrens and Mike Ockrent, it’s set in London on Christmas Eve, 1843. It’s the tale of a curmudgeonly old miser, Ebenezer Scrooge (Christopher Reber), who discovers that money is less important than love for humanity. Once in bed, he’s confronted by the ghost of his late partner, Jacob Marley (Randy O’Hara). Marley warns that the chains he carries could await Scrooge if he doesn’t change his ways. He adds that three more ghosts will visit that night. The first, the sprightly Ghost of Christmas Past (Sammi Hildebrandt), shows him what he was like as a lonely boy and a much happier young man. Next the more mature Ghost of Christmas Present (Jennifer Martinelli) takes him to the Cratchits’ home. Despite their poverty and worries about their youngest, Tiny Tim (Noah Itzkovitz), they’re a happy, loving family. Finally, the looming Ghost of Christmas Future (three actors) shows what will happen if Scrooge doesn’t change. Lamenting his behavior, he becomes a generous benefactor to his clients and the Cratchits. Directed by Hillbarn artistic director Dan Demers, the show moves well, aided by his flexible set. Choreography by Jayne Zaban increases the merriment, as do the costumes and wigs by Pamela Lampkin and the lighting by Carson Duper. Although music director Rick Reynolds’ orchestra plays well, it’s too loud, often drowning out lyrics and getting no help from Ron Ho’s sound design. Overall, the acting is fine, especially by Ambler as Bob Cratchit and Hildebrandt as the Ghost of Christmas Past. Many actors play several roles. Singing is a mixed bag with the best coming from Hildebrandt, Ambler and the show’s youngsters. The first notes of Menken’s score recall “The Phantom of the Opera,” while other songs seem derivative of Stephen Sondheim. Nevertheless, the show’s message of kindness and charity comes through clearly and was well received by the nearly full house on opening night. 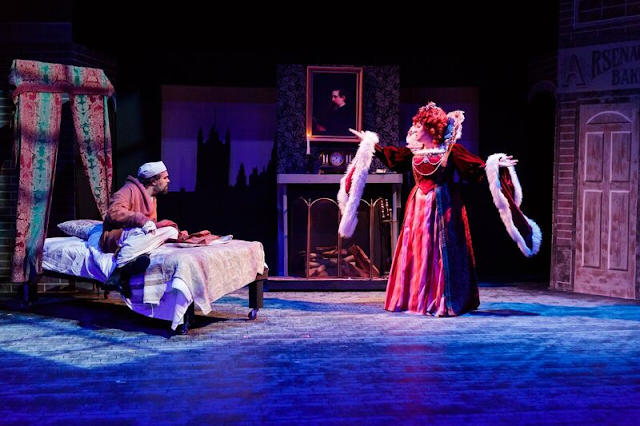 Running about two hours and 40 minutes with one intermission, “A Christmas Carol” will continue through Dec. 16 at Hillbarn Theatre, 1285 E. Hillsdale Blvd., Foster City. For tickets and information, call (650) 349-6411 or visit www.hillbarntheatre.org.